Amazon Alexa voice control comes to 4K TVs at CES 2017 | What Hi-Fi? 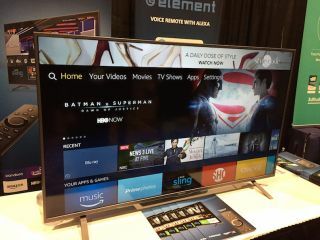 We're rather fond of Amazon's Alexa voice assistant, and now she has been incorporated into a range of four 4K TVs from US companies Element, Westinghouse and Seiki. We first came across Alexa in our review of Amazon's Echo wireless Bluetooth speaker, and were suitably impressed with what she could do. While we wait for Alexa to be made compatible with Sonos later this year, US TV makers Element, Westinghouse and Seiki (all part of the same group) have unveiled their latest 4K models with Amazon Fire TV and Alexa voice control at CES 2017. There are four screen sizes to choose from (43, 50, 55 and 65in) and you get HDMI, a Quad-Core processor, Bluetooth and wi-fi connectivity and Ultra HD (UHD) resolution (although oddly no HDR support). So far so conventional. But the clever part is that the TVs also have built-in Fire TV and voice control, all fully integrated into the set with no separate boxes or speakers. That means no more searching for the remote down the back of the sofa, you can simply ask Alexa to turn the TV on or off, turn the volume up or down or change the channel. With the Amazon app you can ask it to, say, "watch The Grand Tour" or "play Ex Machina". If you have a games console connected, you can just say "go to Xbox". What's more, with recorded or streamed content, you can skip forwards or backwards and ask Alexa to jump to the next episode. We wonder if she'll let you skip the ads too. All the usual Alexa "skills" (or apps as we call them) can be accessed, so you should be able to order a pizza or book your Uber via the TV too. There's no word on US pricing yet, but we hope this is one innovation that other manufacturers will adopt.